I've been enjoying Astro On-The-Go for the past month or so on my iPhone and iPad, and it's definately good news to share that now the app has gone live on Android devices as well. Spread the love, and enjoy selected Astro channels on your favourite device. Following the successful launch of Astro On-The-Go for iOS devices, Android users can now rejoice, as the Astro On-The-Go application is now available in Google Play for free starting with selected Samsung devices. For Astro customers with Android devices to enjoy the Astro On-The-Go experience, Astro has extended the preview period for Astro On-The-Go to all Astro customers. 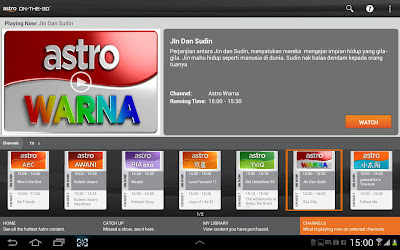 The latest update for Astro On-The-Go application now includes 8 additional radio channels; Radio Hitz, Radio Mix, Radio MY, Radio Sinar, Radio Era, Radio Gegar, Radio THR Raaga and Radio Lite. iOS users are encouraged update their current Astro On-The-Go app to Version 2.7.2. via the Apple App Store to enjoy the new radio channels. For more information or to register for Astro On-The-Go, please visit www.astro.com.my/onthego.